I of course start by planning ahead, which means sitting on my bum and reading the instructions all the way through. Help is always appreciated, but sometimes I get a little to much help. 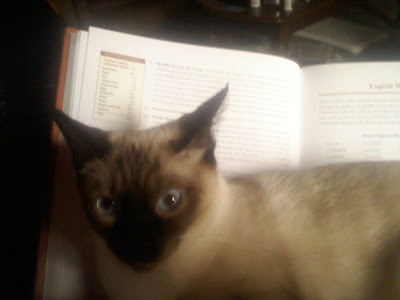 In this instance, Smoky decided he would help me read the BBA recipe which for some reason wore him out and required him to take a 20 minute nap on the book which I was holding up. Now normally, with any of the other cats, I would simply move around alot and they would go find a place to lay that didn't move so much. Smoky though simply gave me a dirty look each time, groaned loudly, and re-adjusted himself for more zzz's. Don't tell anyone, but I finally had to kick him off and send him packing, much to his disgust. The next day I combined all the ingredients, including the flour/kefir soaker and leaving out the cranberry/nut one. The cranberries had soaked up all but a tablespoon of the water, so I included that in the dough. I had to add some water to the dough to make it the right consistency, kneading it with my kitchenaid for 6 minutes. I then added the fruit/nut mix, which added a little bit of moisture to the whole thing and kneaded it for another 2 minutes. I pulled out my King Arthur Silicone Rolling Mat and put extra flour on it, and put the dough into the middle, then folded it a couple times. This created a boule shape, or round ball. Just a note, if you don't have a good place to knead and shape your bread, the King Arthur rolling mat is really awesome. I love it and pull it out for every loaf I make, even if it's just to shape it into a log for a single loaf. I let it rest a few minutes, and then shaped it into a log. I used part of the egg from the recipe to do an egg wash on the crust, and it came out really nice. I took 8 pictures of just the crust, it was shiny and such a nice shade of brown. Just beautiful, tender when eaten, with a beautiful color and shine which made it hard to cut into. It was just to pretty! I realized that I would have to cut it open, so I could see what the crumb looked like. It was just such a perfect loaf that I really didn't want to, except for the thought of taking a bite of it! I took this picture of the crumb inside, and didn't look till later and realized it really didn't show how wonderful the crumb was. The next morning I cut the loaf into slices and froze half of it, then took a few slices and used natural lighting to see if it would help show the crumb. The crumb was darker than normal, but I think that was because of the liquid from the cranberry soaker. It's great tasting bread! I will be making this again, probably for Thanksgiving. It has great taste, texture, and the crust is wonderful too. Definitely a holiday bread. Cute kitty, too! Your loaf looks very tasty, any time of year. It has a very nice crust with lots of color, and the crumb is just perfect, I can see why you are looking forward to making another, why wait so long :)! That is a beautiful loaf Jo_Jo. Perfect crumb structure for that kind of bread. Well done! wonderful looking loaf... excellent colors! LeeYong - Thank you for such nice comments! I just appreciate The Fresh Loaf a lot, because it gives such valuable information to bread bakers. That makes me want to share when I can.